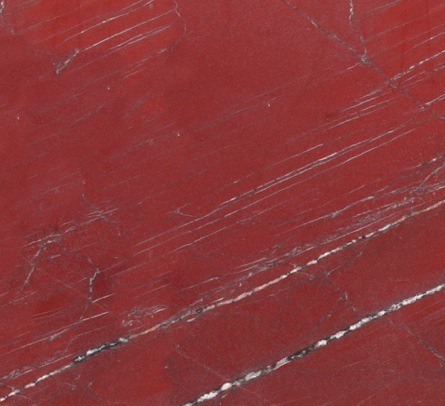 Rosso Laguna, also known as Red Laguna, is an oriental marble characterised by the intense red color. The quarries of Rosso Laguna produce blocks in good quantity, which need to be accurately selected in order to obtain slabs with the most intense color. Red Laguna is a very hard and resistant marble, it is used in high quality projects usually combined with other marble with a more neutral color in order to balance its strong tone. The slabs of Rosso Laguna usually need to be resined in order to improve the structural qualities and fix some micro-cracks which may occur. Ziche vacuum resins all the slabs three times with epoxy resins, enhancing the structural qualities of this marble and without affecting its natural color. Rosso Laguna is mainly used for indoor application and the polished finishing, in particular for stairs, floorings, claddings, tiles, chimneys, countertops,..